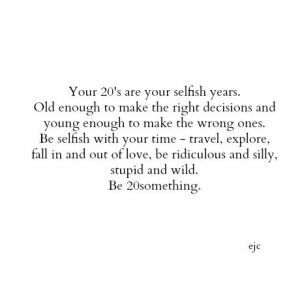 Don’t settle down until you’re at least 30! What’t the rush? You have your whole life to be a partner and parent. Take every opportunity – no matter what! Say yes more than you say no – to healthy and fun experiences. “This too shall pass”- is so true for good and bad things. Know that friends will come and go. Don’t chase them. The right people will stay. Money isn’t everything, so if you hate your job, find something that you LOVE! Date, date and date some more. Don’t just settle with the first one that comes along. Learn to like being alone. Keep in touch with the special people in your life. Get into a healthy lifestyle now- it gets harder the older you get.